Who Knew Camping Recipes Had Such Fabulous Names? Combine sugar and syrup in saucepan. Cook over moderate heat, stirring often, until begins to bubble. Remove from heat. Stir in peanut butter, mix well. Add Rice Krispies, stir until well blended. Press mixture into buttered 13 x 9″ pan. Melt chips over very low heat, stirring until well blended. 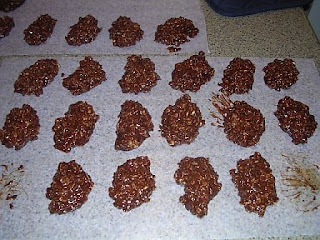 Remove from heat and spread evenly over Rice Krispie mixture. Cool until firm. Cut into bars. Makes about 48 bars 2 x 1 inches. Place all ingredients in a Ziploc bag and mush together until done (5-10 minutes). May need to cool to set up before eating. And…look! You can even have pie at camp! In a small bowl, mix together sugar and cinnamon and set aside. Push the stick or dowel through the top of the apple to the bottom until the apple is secure. Roast the apple 2 to 3 inches above the bed of hot coals and turn frequently. (As the apple cooks, the skin starts to brown and the juice dribbles out.) When the skin is loose, remove the apple from the coals but leave it on the stick. Peel the skin off the apple, being careful not to burn yourself because the apple is very hot. Crumble candy bar (reserve a small portion for garnish) in a pan and melt (if microwave available use microwave). Pour melted candy bar into Cool Whip (reserve 1 tablespoon of Cool Whip for garnish) and fold together. Pour candy bar and Cool Whip into pie crust, add reserved Cool Whip on center of pie and sprinkle reserved candy bar on top of Cool Whip. Set in ice chest or refrigerator to cool for a few minutes. Spread 2 to 3 tablespoons peanut butter over half of each tortilla. Top each with half of the marshmallows, chocolate pieces and banana slices. Fold tortillas in half, pressing gently to flatten and seal slightly. Brush both sides with a little oil. Place a 10-inch cast iron skillet over medium-high heat on a camp stove, grill rack or grate over an open fire. Cook tortillas for 2 to 3 minutes per side or until golden and chocolate is melted, turning once halfway through grilling. If desired, sprinkle with sugar and cinnamon. To serve, cut into wedges. Makes 4 servings. And…who knew banana chips took *4* hours?? Preheat oven to 150F. Spray cookie sheet with non-stick coating spray. Slice bananas into thin slices and place on the cookie sheet. Cook for 2 hours with the door slightly ajar. Flip slices with a fork. Cook for 2 more hours. Bananas should be only slightly pliable. Put sugar, cocoa, butter and milk in saucepan and boil hard for 2 minutes. Remove from heat and add oats and peanut butter. Beat until stiff enough to drop on wax paper. Let cool. Now! Time to venture out into the great outdoors?